Artichokes are the edible, immature flower of a cultivated thistle plant. The artichoke’s quality varies dramatically during the growing season. Initially, the flower heads are dense and crisp with a clear green color. 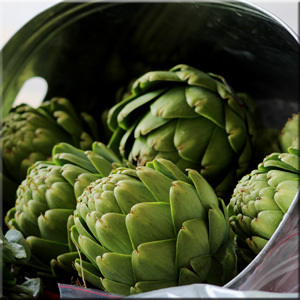 Fresh artichokes produce a noisy squeak when squeezed. Artichokes that have more open leaves are usually overripe and are somewhat mushy when squeezed. If left to mature completely, the inner thistle emerges as a flower and, by then, the artichoke is ‘woody’ and bitter. The size of an artichoke is determined by its placement on the plant. Artichokes at the top of the plant are enormous; those ‘chokes growing midway are the more medium sized and those growing at the base of the plant become shaded by the leaves and are referred to as baby artichokes. Fresh artichokes should all be compact and heavy for their size. The scar on the cut end should have a clean look-a black cut indicates that the artichokes have been stored too long. Use in salads, appetizers, gratins, ragouts, risottos and pastas. The thorny leaf tips of large artichokes should be snipped off. Artichokes were introduced to America by Italian immigrants who settled near Half Moon Bay around the turn of the century. Today, California produces 100% of all commercially grown artichokes in the United States with one particular variety, the green globe, dominating the market. The vast majority (84%) of the crop is planted and harvested in the Central Coast region in fields surrounding the towns of Salinas, Castroville and Monterey.